During the 1930s, at the dawn of the depression, Conklin launched a collection that was priced more affordably to the general public. The Conklin All American collection was offered in a variety of sizes, filling mechanisms and finishes with the aim of statisfying a growing market demand for good quality, but affordably priced writing instruments. Drawing inspiration from Conklin's original models and the rich heritage of the brand during the 1930s, the Conklin All American Brownstone Fountain pen brings a vibrant, contemporary style to a timeless oversize streamlined design. 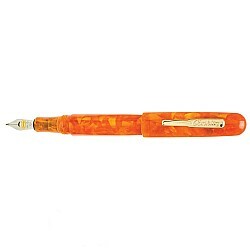 Crafted from hand made European high grade resins, the Conklin All American is impressively large in size, yet no so big as to be uncomfortable in the hand. The cap and barrel are carefully tapered to provide a perfect balance. The Conklin All American Fountain pen has a stainless steel nib and uses a cartridge/converter filling system. The Conklin All American collection meets the requirements for those who want a large pen, one that stands out in a crowd, but which still stays true to a classic style and feel of the original Conklin designs. The Conklin steel nib is suitable for all the Conklin fountain pens. The Fine and Medium nib are bi-color, the Stub nib is silver coloured. The nib ca..